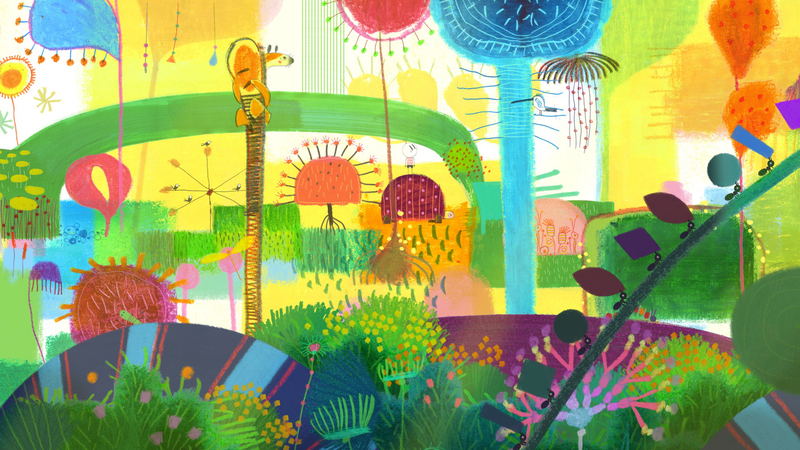 Out of all the Oscar-nominated Animated Features, “Boy & The World” is the most vibrant and innovative, offering an abundance of color in a kaleidoscope manner. 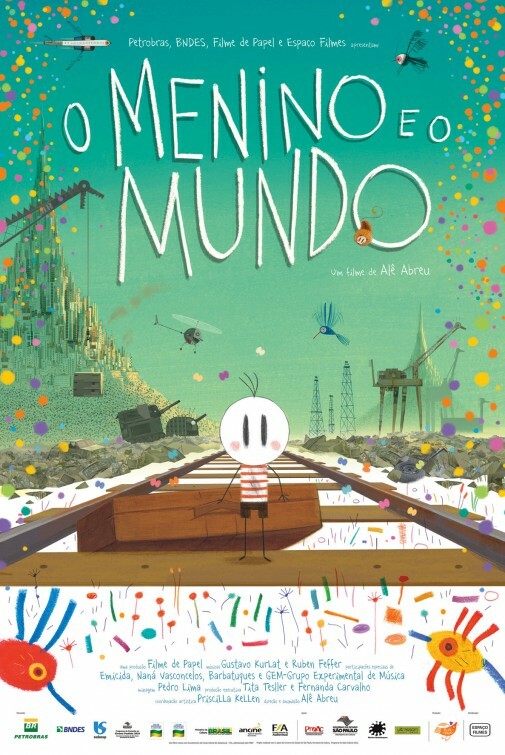 This is the sophomore effort from Brazilian writer/director by Alê Abreu, a follow-up to his 2007 feature-length debut, “Garoto Cósmico” and is fortunately and unfortunately a timeless tale of a boy taking stock of where he’s at and who he is in comparison to the world around him. Without a line of dialogue and an eclectic, energetic score, Abreu communicates the beauty and confusion of exploration and education. The titular character in “Boy & The World” is named Cuca. I had to look that up, since I don’t recall that being mentioned at any point. I also found out that the story takes place on a distant world, in a small village on a mythical country. It does not take place in Brazil or anywhere in South America, although the transcendent, percussive score by Ruben Feffer and Gustavo Kurlat certainly feels heavily-influenced by the culture from that part of the world. It makes sense that the story is not situated on any specific part of our world, since what Cuca experiences on his adventure is universal. When we meet the playful and curious Cuca, he is on his family’s farm, surrounded by a mostly of his environment is stark white, like a blank page. What’s immediately noticeable is Cuca’s design and the look of humans in Abreu’s film. All of them are only slightly more detailed than a child’s stick figure, which could mean that what we’re truly getting is a look at life from a small child. The diminutive Cuca has a big, round head with only three strands of hair and two long vertical slits for eyes – no nose or mouth, yet still quite experessive. It’s all in the eyes. His parents are a little more descriptive – a hat and some lines near his father’s mouth that indicate a thin mustache. The boy’s world expands as he follows a flitting butterfly to a grazing horse to a flowing stream – as he explores, the score of the movie opens up to new and energetic sounds. His journey finds Cuca resting on a white cloud in the blue sky, high above the expansive green farmland and it’s there where he first sees a dirty grey/brown cloud attached to a loud, cylinder-shaped beast with wheels – huffing and puffing more dirty clouds. This is Abreu’s interpretation of machinery, which are designed to look like large man-made animals throughout the movie. 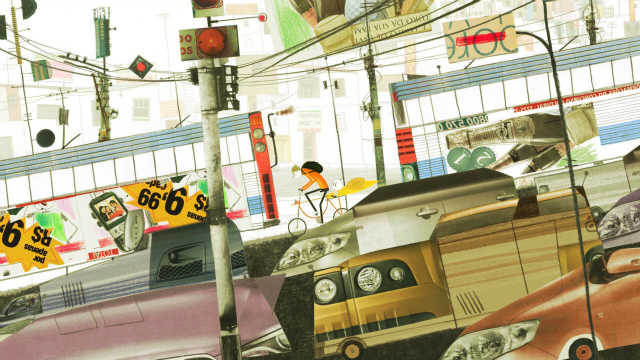 After that experience, Cuca witnesses a giant snake of a train taking his father away, as he searches for employment in the nearby bustling capital. Curiosity leads the boy to do his best to follow that train in order to understand where his father went and why the world around him is changing. It’s here where the film really opens up into something both beautiful and depressing, as we see lush and gorgeous forests and prairies as well as congestive urban areas with stifling industrialized plazas. He also sees a variety of fellow humans on the way – some bent over working in fields, while others jubilantly parading with clanging instruments. There are kids floating kites and cities filled with sports arenas that shoot colorful fireworks. In the slums, he finds people opening canned slop for food and laborers lending each other a hand as others look away. Eventually, Cuca encounters a quiet adult who becomes something of a guardian to the boy. His communication is incomprehensible syllables just like the boy and everyone else he encounters. The two become friends and look out for each other, with the guardian acting as a tour guide through the overwhleming city streets and clogged neighborhoods. One scene with the guardian in particular stands out – when he converts his bicycle into a musical instrument to play for tourists in order to make money. It’s inventive and could believably be taken from real-life. Of course, we know that their friendship will be short-lived due to the familiarity of the hero’s journey. Cuca will have to branch out on his own and make some decisions about the world, before navigating back home. He returns forever changed with his childhood taking on a new perspective and path. 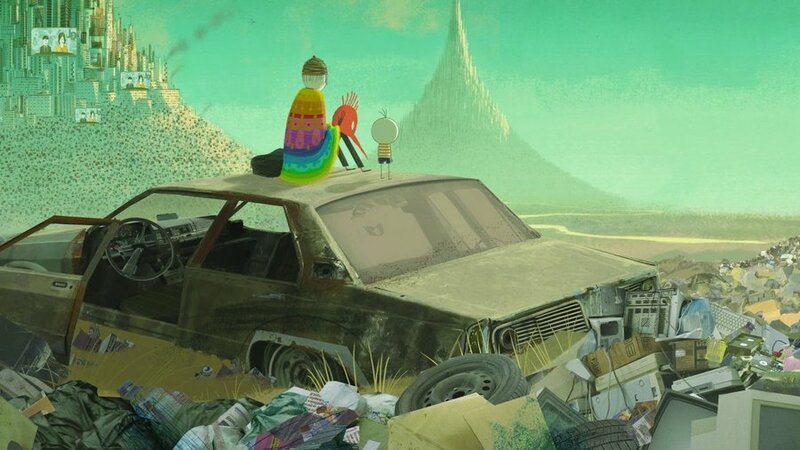 The boy’s journey and the animation approach Abreu uses to tell it is what will be most memorable about “Boy & The World”. It’s obvious there is building social commentary here and the only time “Boy & The World” feels heavy-handed in that sense is when we’re shown a montage of non-animated footage, showcasing the worst mankind has to offer: war, pollution, ecological damage and the like. Another aspect of storytelling that doesn’t always work is when Abreu uses flashbacks when Cuca remembers something significant from his past with his family. It’s not always clear why he’s recalling certain memories and it does tend to interrupt the pacing of the present story. But most of the time, because we’re seeing this world through Cuca’s eyes, details are kind of indecipherable – signs and billboards are jumbled with letters and numbers and there are quick cuts to vague advertisements. Nevertheless, the energy of the film and detailed, mostly hand-drawn animation will keep viewers engaged. At times melancholic, the feature offers reflection and a fascinating look at one’s place in the world. 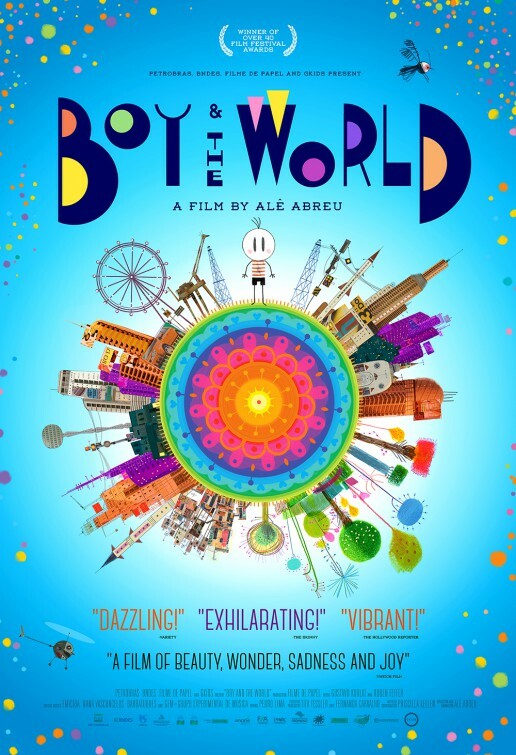 “Boy & The World” is one of the more artful and unique Oscar nominees in its category. 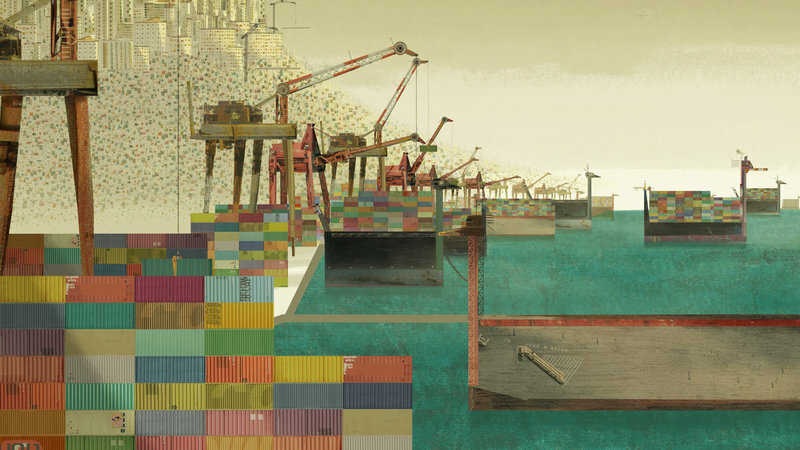 The film’s Brooklyn-based distributor, GKIDS, has done a phenomenal job hand-picking some truly amazing foreign animated features – many of which have gone on to also receive Oscar-nominations – “The Secret of Kells”, “Ernest & Celestine” and last year’s “Song of the Sea”. The inclusion of “Boy & The World” to this year’s other nominated animated features make this category the most eclectic of all the categories this year. All of them are worthy of acknowledgement and should be appreciated, but “Boy & The World”, with its organic creativity and unpredictable journey, should be discovered.